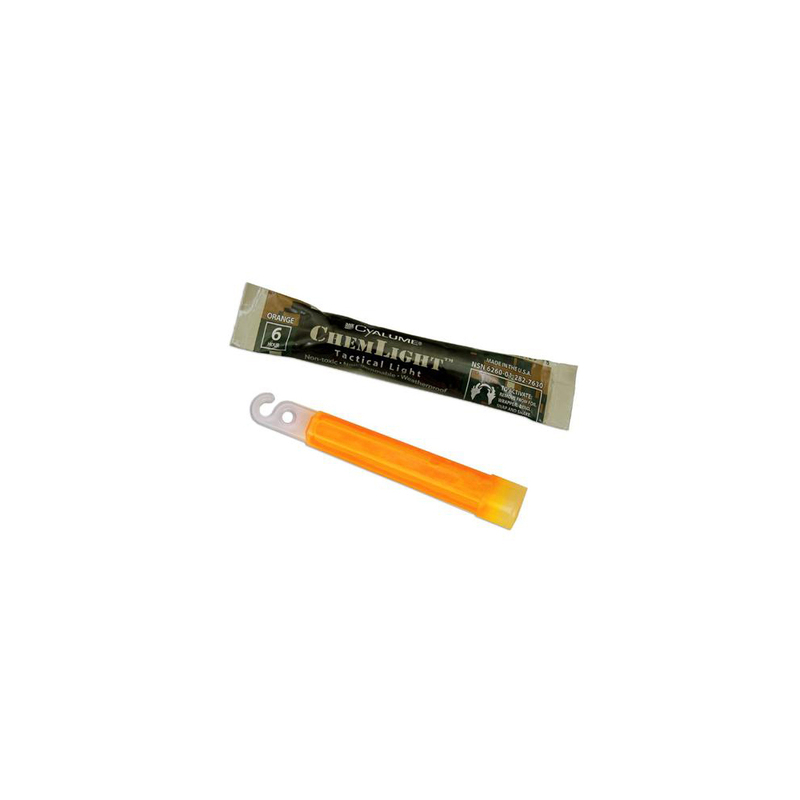 The Cyalume ChemLight is an orange military grade chemical light stick measuring 4" long, for providing instant 360 degree illumination, that can be seen up to a mile away for up to 12 hours in optimal conditions. The ChemLight is waterproof, non-toxic, and non-flammable. To activate the light stick, bend, snap and shake the tube. The light stick has a hook and gate top, for hanging or attaching the light. 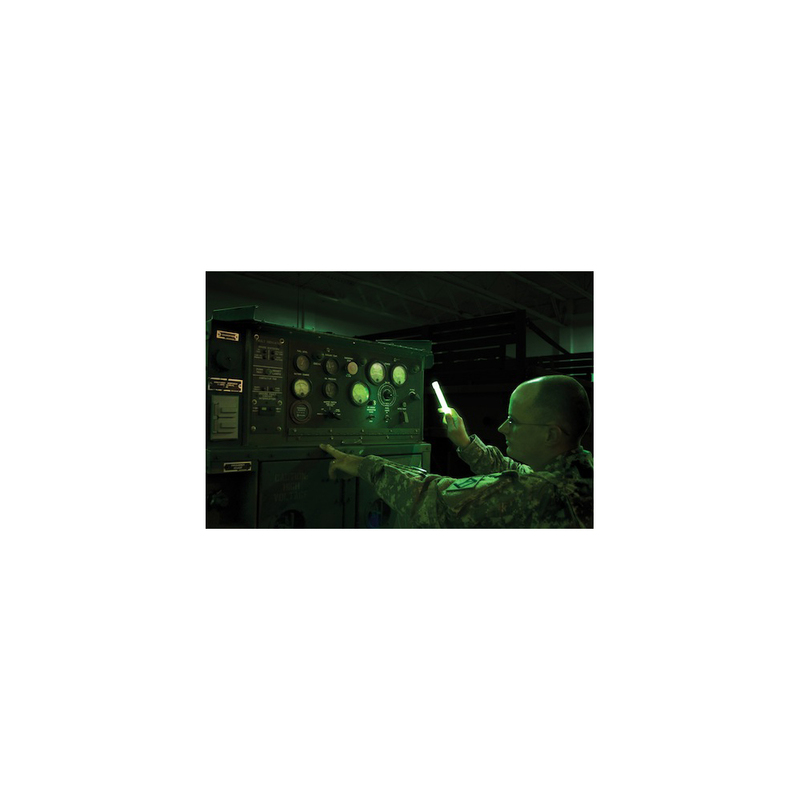 The ChemLight meets Defense Logistics Agency (DLA) and NATO Maintenance and Supply Agency (NAMSA) specifications, and National/NATO Stock Numbers (NSN) are printed on each product. Each light stick is individually foil-wrapped for protection from light and moisture, and has up to a four-year shelf life from date of manufacture. The durable, waterproof, external body of the light stick is made from low density polyethylene (LDPE), and is phthalate free for safety. The internal illuminating chemical substance is non-toxic and non-flammable, and the components of the light stick are recyclable. The light stick floats in water and works best between 40 to 80 degrees F (4 to 27 degrees C), and although the light stick works at higher or lower temperatures, it is less effective in colder temperatures. Light sticks are chemiluminescent substances in plastic tubes that provide hours of illumination in a number of safety, industrial, and military applications. Light sticks are waterproof, non-flammable, and non-sparking, which makes them useful in hazardous situations where sparks or flame could cause an explosion. Duration is determined by the chemistry of the formulation. Brightness is affected by temperature: the warmer the temperature, the brighter the light will appear. All sticks are tested at a temperature of 72 degrees F to determine the illumination duration. Viewing distance can be affected by temperature, moisture, and other elements. Exposure to direct sunlight can reduce shelf life and effectiveness.